Extended, new Edition of Worldwide Bestseller, "The Wonder Weeks," Now Available. Have you ever wondered what's going on in your baby's head? Why is a normally well-tempered baby suddenly difficult and demanding? And then, suddenly, he is doing things he could not do the day before. Research has shown that babies make 10 major, predictable, age-linked changes - or leaps - during their first 20 months of their lives. During this time, your baby will learn more than in any other year. With each leap comes a drastic change in your baby's mental development, which affects not only his mood, but also his health, intelligence, sleeping patterns and the 'three C's' (crying, clinging and crankiness). "The Wonder Weeks" Explained: following each leap comes the 'wonder weeks,' in which the baby has new and expanded brain capacity and is able to learn to do new things. Each leap sets the stage for subsequent development of new skills. The skills that your baby develops first, depend on the baby's preferences, experimentation and physical development. For example, the ability to perceive spatial relationships (about 26 weeks) is a necessary precondition for 'crawling inside or under things,' but this skill normally appears anywhere from 6 to 11 months. As amazing as each new ability is, it is also scary for the baby. Suddenly, he can think, feel, notice and understand what is happening around him in a new way. The perception of sensations does not change with increasing age, but becomes subservient to the new, higher levels of perception that are emerging one after the other in the hierarchy and that are superposed onto the already existing, lower levels of perception. These changes in thinking can show up in changes in what he can do and how he behaves. That is why, before he is able to explore his new ability, he often cries more, is more clingy and crankier. These changes can also manifest as poor sleep, lack of appetite and general fussiness - and exhausted parents. Contents of "The Wonder Weeks": The book "The Wonder Weeks," by Dutch authors Hetty van de Rijt and Frans Plooij spells out the phenomenon happening inside your baby's brain with detailed information about each leap. Based on 35 years of extensive research, "The Wonder Weeks" describes in easy to understand terms the incredible developmental changes that all babies go through during their first 20 months of life. In the years since the publication of the first edition, Dr. Plooij continued to research the developmental leaps in infants together with numerous national and international experts. The results are found in this extended edition of "The Wonder Weeks," which explores the ninth and tenth leap into toddlerhood. These are key leaps to form the basis of a well-educated child in cleverness and in well-raised person. Using this book as a guide, parents can be better prepared - often within a week or two - when to expect the behavior (the three C's: Crying, Clinging, and Cranky) that marks a new change in their baby's development. 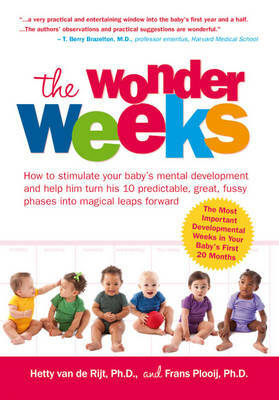 "The Wonder Weeks" provides: a phase-by-phase guide to baby's behavior; an explanation of the markers for the 'three C's' and how to react; fun games and gentle activities parents can do with their baby to guide them through their 'leap'; and, a description of the baby's perspective on the world around him and how it can help parents understand the changes he's going through. Availability: "The Wonder Weeks," which has been an international bestseller for years selling more than 1 million copies worldwide in 12 languages, is more readily available at the website thewonderweeks. There is also an iPhone/iPad app available.